Snap some pics of the views and let the likes pour in. The outdoor pool is a great spot to spend an afternoon as a family. After a long day in the snow, the hot tub is calling your name. Whether going for double-blacks or the bunny hill, the free shuttle gets you there in no time. Crew craving comfort food? Fully-equipped kitchens let you cook up your signature dish. Ski some fresh powder pronto, Argentine and Peru Express Lifts are just a 4 minute shuttle ride away. Your little splashers will love the heated pool. You'll stay warm and toasty at the resort's indoor hot tub. Grab some trail mix and head to Old Dillon Reservior Trailhead, a 14 minute drive. Don't forget your clubs! A 6 minute drive gets you to the River Course at Keystone. Nestled near the banks of the Snake River and surrounded by aspens, spacious suites at Forest Condominiums will have your crew feeling right at home while staying in the heart of a quaint ski town. 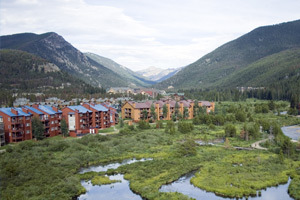 Forest Condominiums is conveniently located right on Keystone Resort’s complimentary ski shuttle loop. Just hop on and arrive at the lifts in minutes! With three different mountains and five bowls Keystone will delight snowsport newbies and seasoned shredders alike. Plus, Keystone is as family-friendly as it gets. A huge snowfort is built atop Dercum Mountain each year and dubbed “Kidtopia,” hosting activities like scavenger hunts and cookie hour. Meanwhile a slopeside daycare to look after wee little ones gives Mom and Dad a chance to hit some double-diamonds. Take a leisurely ride down the three and half mile long Schoolmarm run, or check out one of Colorado’s top terrain parks the famous A51. But the resort’s most distinct draw is night skiing. With plenty of floodlights and well-groomed runs, Keystone has more night skiing terrain than any other mountain resort in Colorado! So get the most out of your winter vacation with powder days that go till 8 pm or later, plus night tubing for the kiddos. Once the crew is thoroughly snowed out, hop back on the free resort shuttle and head back to Forest Condos for a hearty home-cooked meal, courtesy of your well appointed en-suite kitchen. In the grand tradition of ski trips, finish off the evening with a trip to the hot tubs for a soothing aprés soak. Spacious, homey studios and one- and two-bedroom units are individually decorated in tasteful, alpine-inspired style. A fully equipped kitchen (and supermarket just across the street) lets you whip up whatever you’re craving or delight the crew with your world-famous Shepherd's Pie. Roomy living areas provide an inviting space to kick back and relax, with comfy Queen pull-outs to sleep an extra mountaineer - making Forest Condominiums prime lodging for families and friend groups. A cozy fireplace with every unit adds alpine charm. A classic ski town, there’s no shortage of shops, dining and activities to keep your crew busy. Go skating with the family on a whopping five-acres of Zamboni-maintained ice at Lakeside Village, or go for a romantic horse-drawn sleigh ride. You can even book a dogsled tour - where you actually learn to mush! Take a break from the snow with an afternoon of pampering at the Keystone Spa, which offers up all the spa menu classics plus luxe specials like the Alpenglow Facial or Cinnamon Paprika Mud Wrap. For an unforgettable date night be sure to book a table at Alpenglow Stube. At an elevation of 11,444 feet and accessible only by an enclosed gondola, the Stube boasts the highest AAA Four Diamond dining experience in North America. Feast on contemporary Colorado cuisine (with “Bavarian flair”) prepped by award-winning chefs as you congratulate yourself on planning a totally epic vacation.